I have known Justin.tv for years, but only recently I started watching StarCraft II gaming streams. I was bored, no blogging, gotta find something else to kill time. Just like every websites, the stream pages have too much stuff. When you just want to watch the stream and to chat, thats all. But you get a lot of stuff you dont need, that wastes browsers resource to keep them. Yes, you can pop out the stream and chat. However, you dont want to pop them every time you want to watch. Why not just a simple URL, bookmark it, and you can get the stream and chat? Moreover, sometimes, I open two streams and one YouTube video from my subscriptions. I need something simple. The viewer is seen at bottom right corner. My window manager is dwm, I switched to it only for a couple of days. The web browser is Firefox with Vimperator. Everything is as cleanly as possible. You dont see the window title bar because of dwm, you dont see space waster of browsers toolbars. The only unnecessary thing you can see is the statusline of Vimperator. I discovered this channel Walking Home when I searched for cooking, its about a long walk from Arizona to Michigan. Its basically a 24/7 channel and a OK channel to use as an example. (There are many channels on Justin.tv, I dont feel OK) It might be boring for most of time, often interrupted due to poor connection, but you could see the real life. Real reality tv, not those scripted unscripted-claimed lame tv shows. At first glance, it looks like a normal Justin.tv embed, move your mouse over below the logo, you should be able to see the controls. 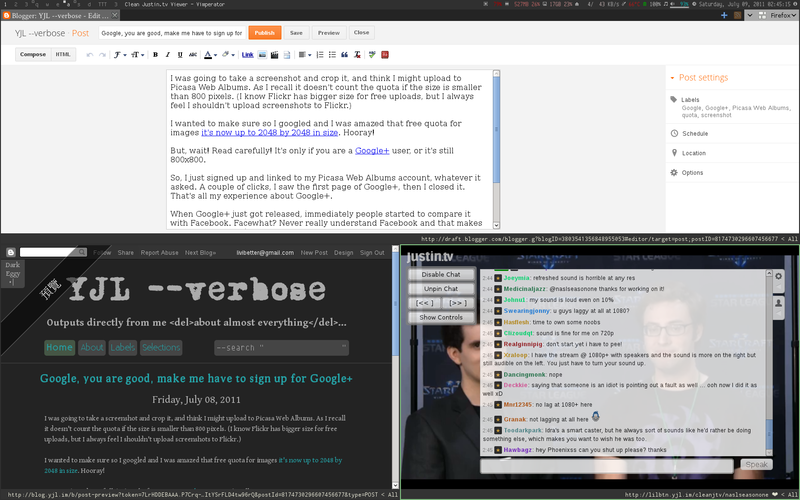 I like the chat box overlays the video and I can hide the bottom bar to make the video as largely as possible.